how to construct an angle bisector of a given angle. how to use an angle bisector to construct some angles for example, 90 degrees, 45 degrees, 60 degrees, 30 degrees, 120 degrees, 135 degrees, 15 degrees. An angle bisector is a straight line that divides the angle into two equal parts. Step 1 : Put the sharp end of your compasses at point B and make one arc on the line BC (point S) and another arc on line AB (point T). Step 2 : Put the sharp end of the compasses at S and make an arc within the lines AB and BC. Do the same at T and make sure that the second arc intersects the first arc. Step 3 : Draw a line from point B to the points of intersection of the 2 arcs. This line bisects ∠ABC. 1. From the vertex, draw an arc across both rays of the angle. 2. From each arc intersection draw another pair of arcs that intersect each other. 3. Draw a line from the vertex to the intersection point to form the angle bisector. How to draw an angle bisector using a compass and a straight edge? 1. Place compass point on the vertex, and draw an arc across each ray. 2. Place the compass on each arc intersection and draw a further pair of arcs which intersect each other. 3. Use a straight edge to connect the intersection point to the vertex. How to bisect a given angle using only a compass and straightedge? The figure shows a point A on a straight line. Construct an angle of 45˚ at point A.
Construct a 90˚ angle, and then construct an angle bisector to obtain a 45˚ angle. How to construct 30, 45, 60, 90, and 120 degree angles with a compass by constructing angle bisectors? 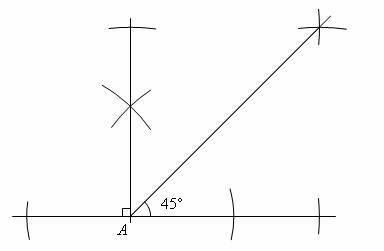 How to construct a 75° angle by constructing a 60° angle and a 15° angle?